Everyone who has a Dutch Oven knows how fantastic they are. Everyone who has ever camped near someone with a Dutch Oven dreams of having one. One of our favorite things to cook in the Dutch Oven is amazing bread. Making homemade dough can be intimidating but we have found the easiest, and most delicious, dough recipe you will ever discover. 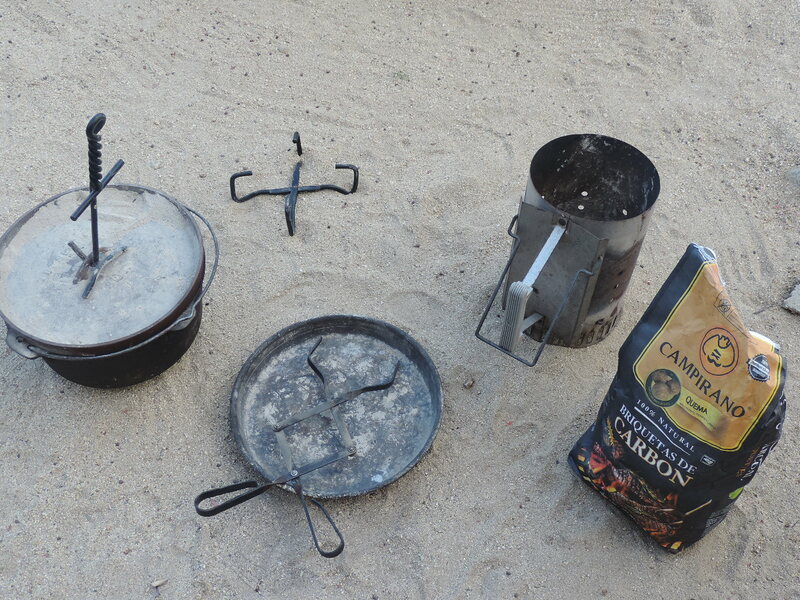 With a bit of planning ahead sitting around your campfire eating Dutch Oven bread with dinner is a simple task. First of all, you need the Dutch Oven necessities. Number one, of course, is the actual Dutch Oven. These come in a variety of sizes but we have found that a 12-inch oven is perfect for making pizza and bread as well as being large enough to serve up enchiladas, lasagna, or a nice stew. Although not essential having a chimney to light your coals is extremely helpful. Beyond that, there are a variety of tools offered, some more relevant than others, but we also use a lid rest to set the hot lid on when checking cooking progress, a lid lifter to remove the said lid from the oven without requiring heavy-duty gloves, a metal set of tongs to move the hot coals into place and rotate them when needed, and a small pizza pan or similar to set your oven on. This last item comes from the experience of difficulty in finding a level spot to set our oven which can cause uneven baking. By heading to Goodwill and picking up a $1.00 deep dish pizza pan we contain our coals and create a level cooking surface. The most important element in this dough recipe is time. Girl versus Dough offers up a dough recipe that is sheer easy perfection but it does require anywhere from 8-18 hours of rising time. Plan accordingly. Bread is magic. Flour. Salt. Yeast. Water. That’s it. That is all required to make amazing bread that you cooked yourself. Here is the recipe we have used for years with amazing success. until a shaggy dough forms. The mixture will be wet and very sticky to the touch. sheet of plastic wrap and let rest 30 minutes. paper beneath (i the bottom of Dutch oven is not coated with enamel, keep parchment paper beneath dough). Cover Dutch oven and return to oven. golden brown on top. Cool slightly before slicing. Now, you will note this recipe was made in an enameled Dutch oven pot in a normal home oven. Never fear. The procedure is the same you just need to know how many briquets are required to get your camping Dutch oven up to temperature. We love this handy chart. Just follow this chart to 450 and you’re set. And that is it! Some of the best bread you’ll ever eat, created by you, with almost no effort. Do you make your own version of Dutch Oven bread? Share your recipes!